Foodoppi owners Louise Lennox and Aisling Larkin approached Edmundson Design with a brief to update their existing logo and I worked closely with them to design their new brand identity. They specifically wanted a modern, clean, gender-neutral logo with authority, as well as being exciting, playful and fun. Louise and Aisling specifically wanted a logo that avoided the usual associations with children’s food logos and instead wanted it to focus more on the science aspect of the business. After working through numerous routes a final design was selected – one with a test tube forming the letter ‘i’. The finished circular logo contains hand-drawn lettering created to match the curves of the test tube letter ‘i’. 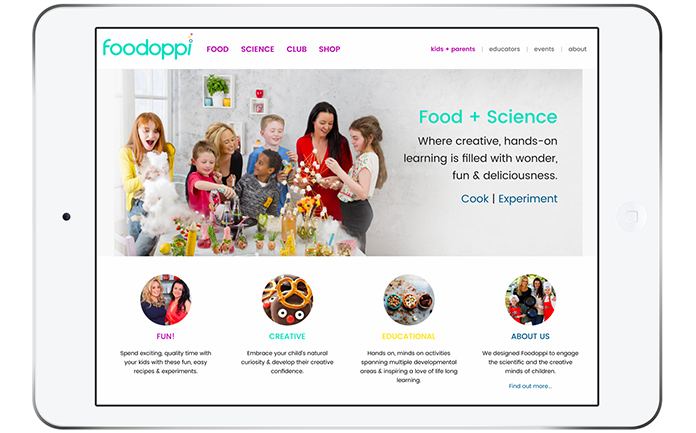 Foodoppi website by Heidi Jermyn.